View of the gatehouse of Rothsay Castle, Isle of Bute, Scotland. 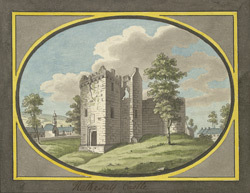 The stone castle depicted in this print was built on the site of earlier fortifications in the early 13th century. It has been attributed to Walter, the Kings third steward. It is situated on a small mound in the middle of a wide moat. The imposing castle has 4 circular towers and a very unusual circular curtain wall. The main entrance to the castle was over a drawbridge through the gatehouse and King James IV decided to improve the gatehouse to make it more impressive and more suitable for royal accommodation. A great hall and a prison were incorporated in the design which was completed by King James V.